Why Does Hair Fall Out for Men? Any man that has suffered hair loss has asked themselves the question – why is my hair falling out? The question is often asked in desperation, as seeing your hairline and hair disappear can provoke intense feelings of stress, shame and a feeling of helplessness that comes with realising that your looks are now out of your control. Unfortunately, most men just accept the fact that their hair is falling out, and that it will continue to fall out. Often the fear of judgement leads people to avoid seeking treatment and advice, when in fact, advice and treatment that could help you to not only stop your hair from falling out but assist you in restoring, regrowing or replacing your lost hair do exist. Advanced Hair Studio exists to provide this advice, as well as the treatments you need. We analyse the health of your hair follicles and scalp to identify the reason for your hair loss. We can then chart the best way forward. Why Is Hair So Important to Men? For many men, hair is central to identity. The styles and looks we choose allow us to express ourselves and provide other people with an insight into who we are. It’s why so many surfers have long blond hair and military men have the short back and sides. Of course, many men choose to be bald, but the most critical part of that sentence is the word ‘choose.’ That’s why a loss of hair is so devastating to men because it takes away the choice of the hairstyle wanted. If this lack of choice is staring you in the face, you need to take control. The technology is there, and the expert hair loss doctors at Advanced Hair Studio are available to put the power of your appearance and your visual identity back into your hands. There isn’t just one reason for hair falling out, often there are a number of contributing factors. These factors can be related to lifestyle and genetics, and when they combine, hair loss results. With such a range of contributing factors, it’s essential you visit us, so we can find the cause and provide advice on the appropriate treatment. 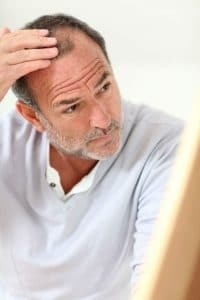 Without knowing what is causing the hair loss, you can never hope to address it, which means you will have to accept hair loss as part of your future. Advanced Hair Studio offers a suite of industry-leading treatments and solutions to maximise your chances of reversing hair loss in a long-term and meaningful way. From flagship treatments like our Laser Hair Growth Treatment, Strand-By-Strand® and our Advanced Singular Grafting, right through to our highly-specialised trichologist-led lifestyle treatments, Advanced Hair Studio has an answer for you. We will determine what’s causing your hair loss, and we will stop it.